Now fur is controversial and I am not entirely sure why, when leather is all the rage. Hides, with fur intact, were worn by mankind especially in cold climates and are durable, warm, flexible and beautiful. 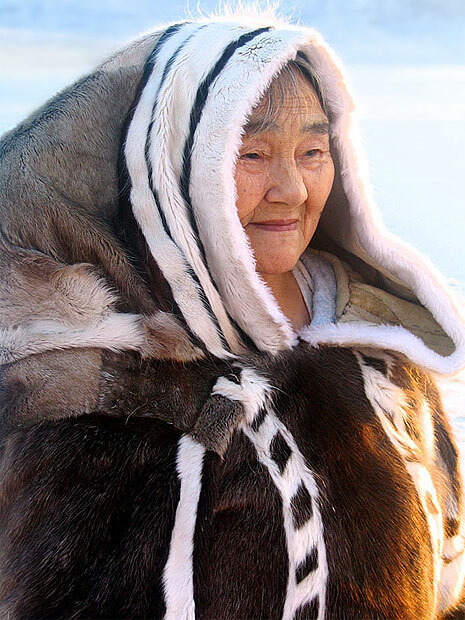 Indigenous people in arctic regions wear fur from necessity as well as tradition. Of course there is a legitimate concern that hunting certain animals for their pelts has already wiped out or endangered species. It is therefore completely reasonable that these species are protected and it is no longer possible in most countries to buy an Ocelot jacket, for example. On the other hand animals bred for their fur – such as mink, fox and rabbits – account for most fur used in garment making today. Although some misguided animal rights activists have released farmed mink into the wild, where they have either perished or gone on to wreck natural ecosystems, there is no reason to think that farming is intrinsically cruel. To my mind, leather is the same as fur, but without the fur. Unlike humans most other mammals have fur, or hairy skin. Once removed you get leather. The only question for me is an aesthetic one – I have no moral objection to wearing leather or fur. Some people choose not to eat meat, animal products, or even carrots. Likewise some people prefer to wear plastic shoes and fake fur, made from oil derivatives. Leather comes from cows, sheep, goats, camels, dogs, cats and bears for example, and all these animals have fur that can be preserved in order to make fur items. I like wearing leather shoes and belts and I am keen on fur too. I have had a number of vintage fur items – a dark brown fox tippet was a favourite until the moths ate its little ears. Also I have a Russian style rabbit fur hat that I bought in Berlin. It has flaps to cover my ears and cheeks on the coldest days. Unlike wool or synthetics that irritate my skin I find real fur is the most delicious fabric to wear. I am in the Arctic Circle in this jolly photograph. 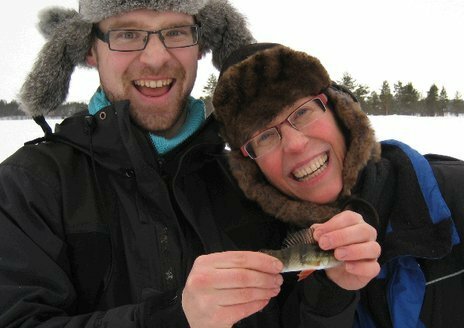 I have just caught (much to my delight) a tiny fish – my first experience of fishing, and my first experience of drilling a hole in the ice first. The instructor holds my fish, and we both wear lovely warm fur hats. includes lots of shades of colour (like our hair) which gives movement and life to the garment. If it comes from an animal with distinctive markings then the variety of toning colours can be very pretty, especially when matched to your skin tones. Last Christmas I got some “fun fur” and made fur collars for all my female relatives and friends. The free pattern was generously provided by Tilly Walnes. The fabric came from Simply Fabrics and I bought this light grey and some darker grey too. 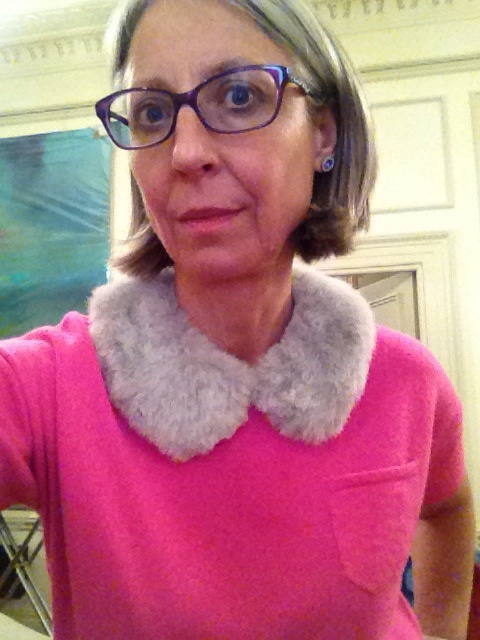 I backed the collars with bright pink or turquoise silk, and fastened it with a fur hook. This made me want to make something in fur – perhaps a version of an anorak or parka, with the fur on the inside. Or a luxurious fur lined hood on a cloak. Or maybe just a really nice fur collar in a lovely shade on a nice 1950s coat. I don’t have a plan yet but I would really like to make something furry. Ooh, this is a difficult subject, but the controversy surrounding fur is more to with the conditions the animals are kept I think! Where as a lot of leather is a bi-product of he meat industry (and some of those animals are in less desirable conditions), fur is generally taken from an animal purely for this product and the conditions for the animal are just barbaric! You probably don’t want to explore images from the fur trade, as they are very disturbing, but I’m definitely not into the idea of new fur. Vintage fur is something that seems ok as a concept, as you are not supporting this industry as such, but then it still encourages the notion. There are some amazing fake furs out there though. Sorry to disagree, but it’s good to see different view points! I’m not sure. I am in favour of traditional aboriginal hunting rights and so fur used in that context I think is fine. I suppose that fur hunted using traditional methods and sold would also be fine. I was at a demonstration of Inuit games at the Governor General’ s residence this winter and I not only loved the games but thought the jackets and sealskin pants worn by the demonstrators were beautiful and practical. The thing that I remember about the furs worn by my grandmother was the respect that they were shown. They were taken every spring to be cleaned and stored. They were treated with respect and worn for at least twenty years. How many people have garments that they wear for twenty years these days? I do understand the cruelty arguments against fur but how many people buy fabrics or garments made by humans in conditions they barely question and then toss out within a year or two? And let the us not even begin discussing the environmental cost of shipping all of the disposable junk that we do from market to market. I am no expert on the ethical issues surrounding new and or vintage fur, but it is worth asking all of the questions. Something peculiar in my life was that when I was in grad school in Montreal I rented an apartment above a fur shop for a couple of years. 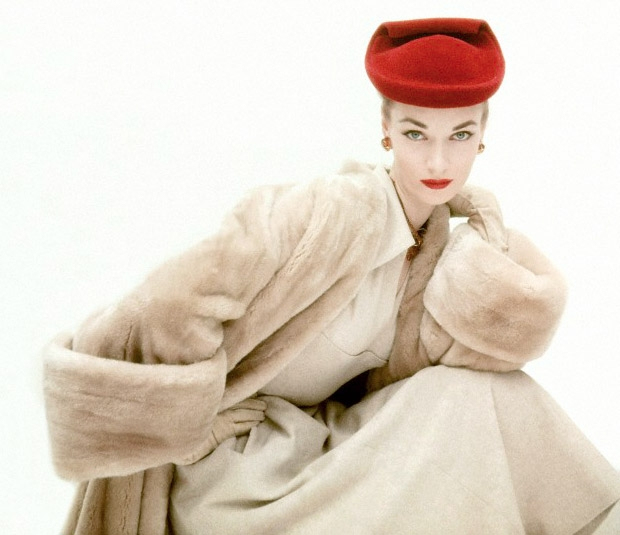 It seemed like a place pulled right out of the 1950s, because fur was so out of vogue in general society at that time. I only entered the shop once or twice out of curiosity. PS Forgot to mention that I have had a parka for many years that has a rabbit fur hood that I love and that is ideal in our winters. At the time I joked because I bought it in Europe and it is Canadian rabbit that I was re-patriating the fur. I don’t wear fur. There is no reason for it when there are great imitations available or when vintage pieces can be cut and recyled. I love this little collar! If I were cold enough, I’d wear it in a heartbeat. What a fun gift! I would like to make you one Brenda. It is surely cold from time to time in Oregon. Email me your home address and I will have one to you (at least in time for Christmas)!